Scientists are starting a novel project to investigate whether overfishing alters fish behaviour and changes their pattern of development. Overexploitation of stocks has already been shown to select for smaller fish. A team reporting at the meeting of the European Society for Evolutionary Biology in Germany will deliberately remove the largest individuals from populations of lab-bred guppies. The experiment is designed to uncover what is happening in our oceans. "There are clear indications that almost all... commercial fish are shrinking," said marine biologist Carl Lundin, who directs the International Union for the Conservation of Nature's Global Marine and Polar Program. For mass spawning fish such as cod, there is a great advantage to maintaining older, larger females because they are very efficient at restocking the population. And if industrial fishing selectively removes the largest individuals, explained Dr Lundin, the industry suffers as populations are reduced to the smallest fish. However, smaller seafood is unlikely to be the only consequence of industrial fishing; research has also shown that fish in the oceans are reproducing earlier. Now evolutionary biologist Beatriz Diaz Pauli and her colleagues from the University of Bergen, Norway have begun an experiment that they hope will help uncover what other changes we can expect to see in the oceans' fishes. 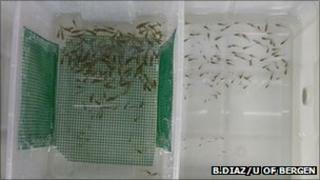 The team established nine populations of guppies, each comprising 500 to 900 individuals. Over the next few years, Ms Diaz plans to remove all the fish that measure over 16mm from three of her tanks. In the remaining tanks, Ms Diaz will purge fish under 16mm, or take fish independent of their size - regimens that will act as a control for the effects of changing the density of fish in the tanks. The team will then painstakingly record the changes that they see in the fish's growth rate, age and size of maturation, reproductive effort, and mating and feeding behaviours. The team hopes to unpick whether the shifts they see are a result of fish moulding themselves to a new environment - a so-called plastic response - or are a consequence of genetic changes. Plastic responses are not inherited. For example, an organism might reach a smaller body size if it gets little food as a juvenile, but its young would not inherit this propensity to be small. Genetic responses, by contrast, are inherited, and even if a future generation is returned to an environment where food is plentiful, it would remain small. Determining the nature of the changes in the fish will help scientists understand how stocks might recover if overexploitation stopped or breeding grounds were protected. "If we set aside 20-30% of the habitat where reproduction... of key commercial fish stocks [occurs], we are much more likely to avoid these types of problems," said Dr Lundin. He added that carrying out experiments of this type allows researchers to control other factors that could affect the fishes' survival and concentrate on just the consequences of overexploitation.